the scent of green bananas: high fiber diet. Posted by santos. This entry was posted on 20060401 at 3:04 PM You can skip to the end and leave a response. Even that should have tasted good with all that butter and jam! I can't answer the why-it-tastes-like-cardboard question but I like the photo. 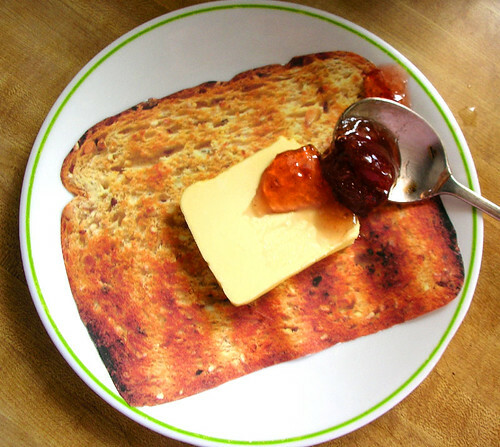 I'm actually pretty fond of toast with butter and jam but for some reason I never eat it. i love the title! you clever green banana you. You've captured this one to great effect! I LOVE IT! hi rabbit! sadly looks like the majority of commenters like the new look. oh well, you'll never know when i'll change it again! cathy, ha. it probably tastes just like what i normally eat, those ryvita/wasa flatbread thingos. julie, i do the same thing, why is that? i tend to overlook toast and jam and yet it's so good when i bother. saffron, i am a depleted banana and the moment. anthony, what's hiding in that second dimension? whoo! reid emerges! love your sandwiches. hope you aren't working too hard! Santos, can you overlap the title and the picture in your current system?